A printed Sticker / Label on a product, envelope or parcel adds a professional touch and will really compliment your existing business stationery. 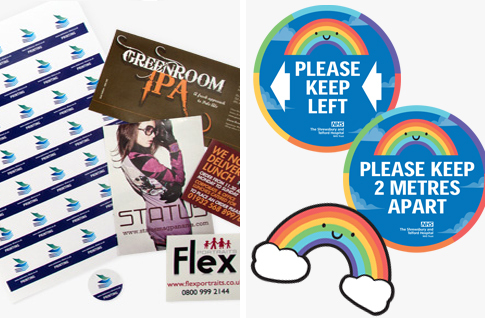 We can print full colour Stickers showing your return address, logo or any other design of your choice. We offer a choice of round Labels supplied on sheets or straight edged Labels which are trimmed to size and supplied loose. Our affordable printed stickers offer great value and are well worth the money spent. Although small in size, people will notice them straight away, making them ideally suited to packaging, promotions and marketing – the list is endless!